What better way to start your fall than participating in the 20th Annual Elk Fest? Estes Park becomes full of the evocative call of this majestic beast during the early days of autumn. It signals the start of the rutting season, when the bull elks leave the wilderness to show up to our society and fight for affection. These antlered frequenters, along with the extensive Western heritage, are being honored yearly by wildlife enthusiasts and simple visitors alike. This year’s event takes place from Saturday to Sunday, September 28th to 29th, 2019. The entire two-day festival is free although there are admission fees for the bugling contest. 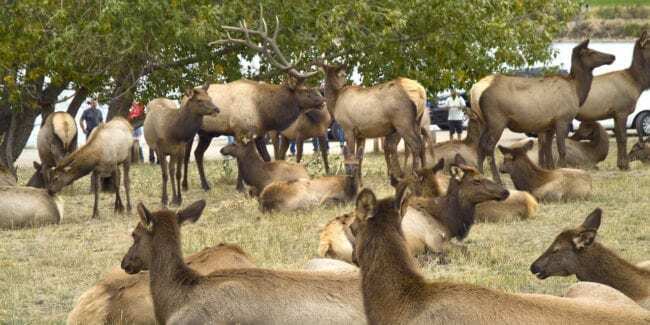 Elk Fest is held in Bond Park and the surrounding areas. Truly, Elktober screams celebration, entertainment, and fun! It all began 20 years ago, when the community developers took advantage of the huge gathering of people and even those only enjoying the view from their windows, by organizing the very first Elk Fest. It has become a yearly celebration in Larimer County since then, delighting new attendees every season. Everyone is up for a real treat, as this two-day festival features many fun activities to spice up the celebration. Bugling Contests, where the producer of the closest and best-sounding elk call, as judged by the crowd’s enthusiasm, earns a prize. Run/Walk Racing (Rut Run 5K). Elk Exhibits such as artworks, handmade elk-ivory jewelry, and even distinctive elk cuisine. Wildlife watching, wherein representatives from the Rocky Mountain Raptor Program display some of their magnificent rescued birds. Elk Seminars that educate visitors about the elk breeding season (Rut), elk biology, management and wildlife in Estes Park. On-site vendors that offer food, elk-inspired arts and crafts and other memorable souvenirs. Craft Beer Garden (Wallowing Hole). Children’s area for dancing, story-telling and other elk-themed activities. There is also the Mountain Men Rendezvous where mountaineers from across the United States gather to sell their crafts and show off their abilities. On stage live entertainment from some mainstream Colorado bands that offer real country, rock and bluegrass music is also present to light up the park on both days.